MCS & PPPR Blog Hop Winner!! 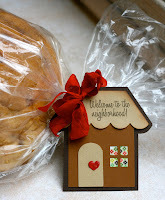 It was so much fun to team up with PPPR for our blog hop last weekend! 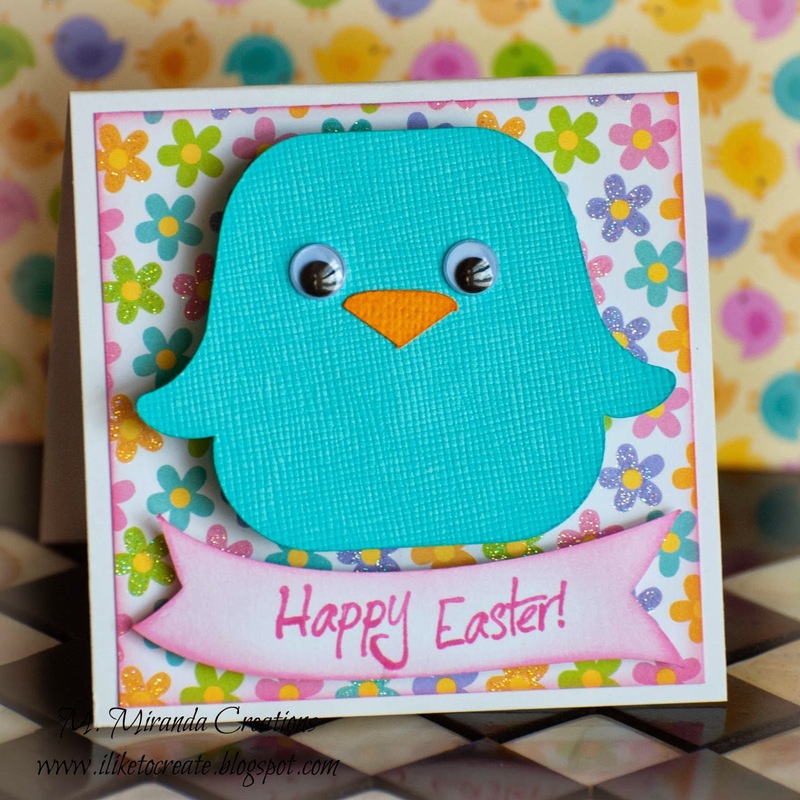 I hope you all enjoyed the fun, Springy inspiration as much as I did! It's time to announce a winner of the $20.00 gift certificate to My Craft Spot from the Spring Blog Hop! I agree Kim...all the projects were super cute and oh so inspirational! Love all the details you added to your projects today! Great creations! Monday Challenge #131 - Thank You cards and Gifts! Hello my creative friends! Happy Monday! Are you ready for another fun challenge?! Heather's card is stunning! I love the background texture and her vintage car image - so pretty! 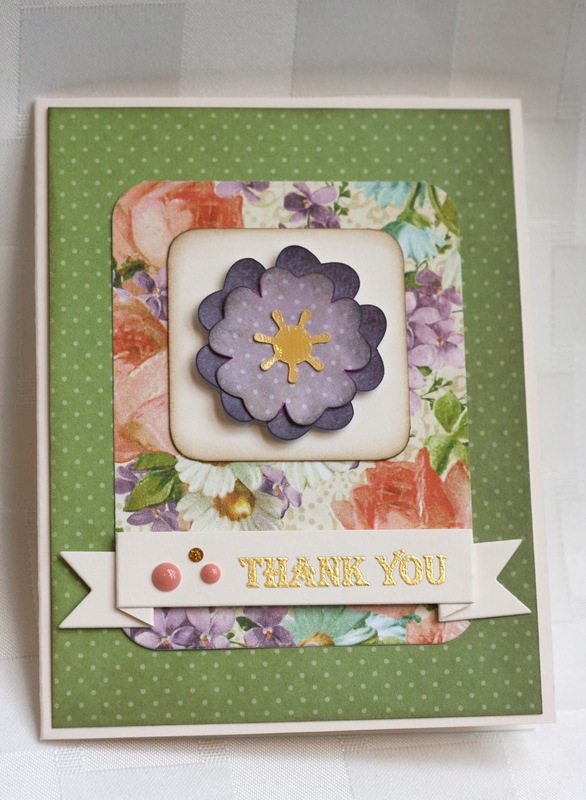 Tanya's flower shaped card is gorgeous! 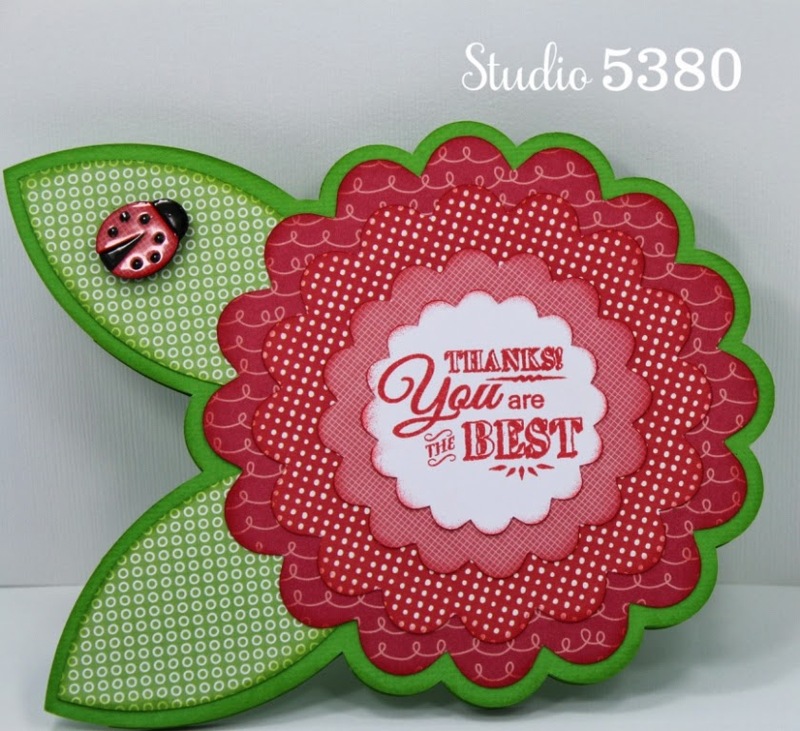 I love all of the fun patterns she used and her ladybug looks amazing! Super cute card! Ally's card is gorgeous! Her papers are soooo pretty and I love the gold embossing on her sentiment! Wow! Click HERE to see all of the fun stamps, metal dies, sequins, bakers twines and ribbon at My Craft Spot! In need of inspiration?! Visit the Gallery to see over 1000 projects arranged by stamp and metal die set! You can even search by Holiday, project type, or products used. So much inspiration all in one place!! 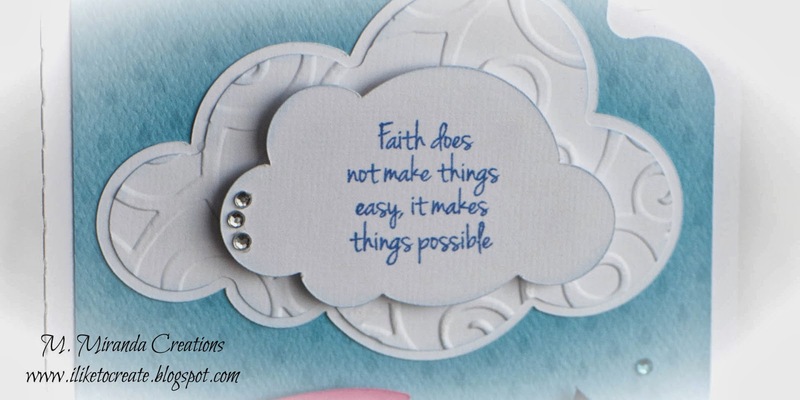 Pretty Paper, Pretty Ribbons & My Craft Spot Co-Blog Hop! Hello, my crafty friends and welcome to the Pretty Paper, Pretty Ribbons and My Craft Spot Co-Blog Hop. 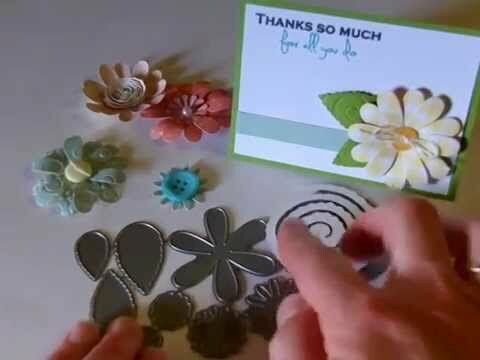 Design team members from both PPPR and My Craft Spot have joined together to create some fabulous and fun projects using stamps from My Craft Spot and files from Pretty Paper, Pretty Ribbons. If you came from Leanne's blog, you are in the right place. If you would like to start at the beginning, click here to visit Lisa's blog. 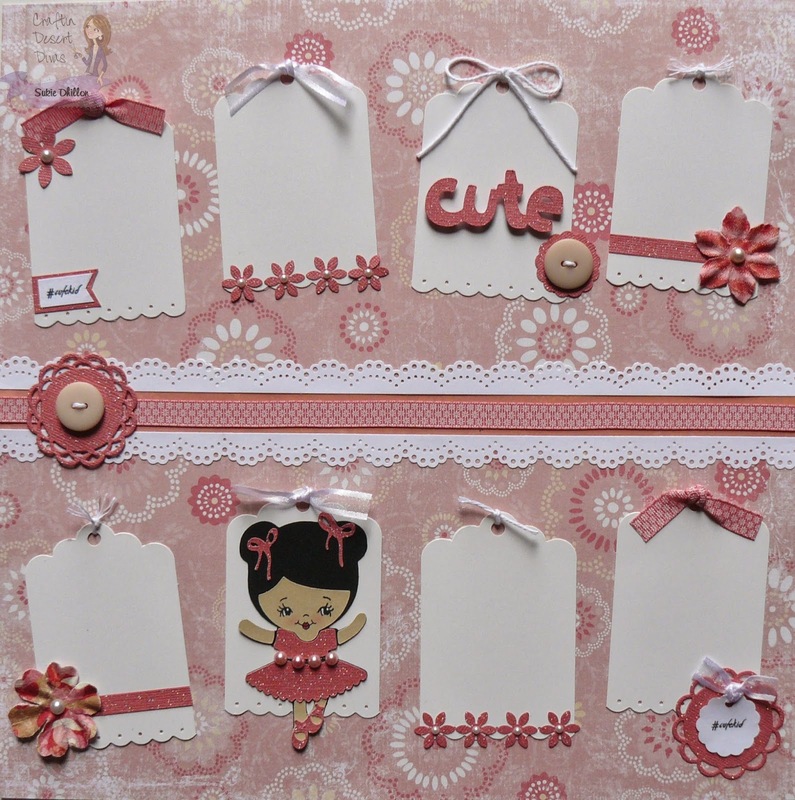 Lisa at PPPR has lots of cute cut files! They are so easy to work with and I love all of the intricate layers she creates for each one! This cute little duckling is a cutting file from PPPR. Doesn't he just look so happy?! The fun and fabulous grass border was cut using the Fancy Edges metal die set. I cut it out 3 times, inked all of the edges and then added lots of dimensionals. There are so many fun layers on this little duckling cut and I inked each one of them! I also added a bit of chalk for the cheeks and some dimensionals. The fun sentiment is from the Cute Critters stamp set. All of the projects on the hop have been fantastic! Be sure to leave a comment on each blog on the hop for a chance to win some great prizes! For a chance to win, you must be a follower of each blog and leave a comment on each blog. 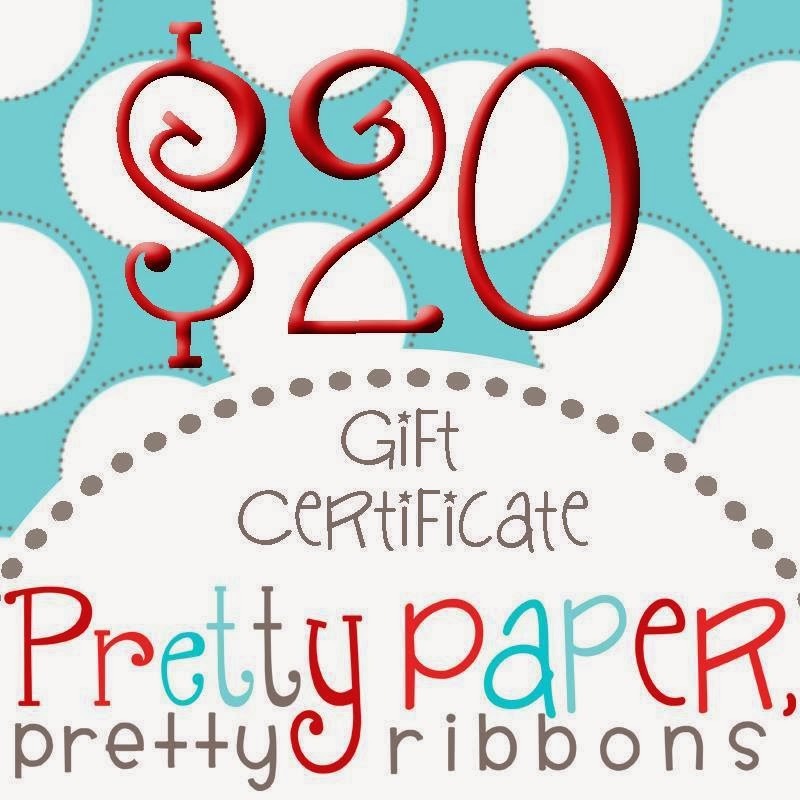 For extra chances, you can also "like" Pretty, Paper, Pretty Ribbons on Facebook and My Craft Spot on Facebook. Thanks so much for hopping along with us! I hope you enjoyed all of the fabulous projects as much as I did! 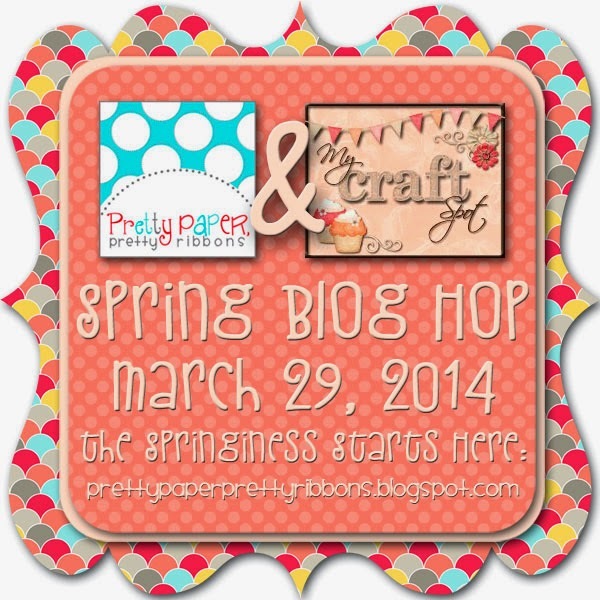 The Spring Blog Hop is tomorrow! Tomorrow (Saturday) we are having a Spring Blog Hop! My Craft Spot has teamed up with Pretty Paper, Pretty Ribbons to share some fun Spring projects with you. There will be some great blog candy as well as lots of crafty inspiration. You don't want to miss this!! *Keep scrolling down or click HERE for today's fabulous guest designer! Guest Designer - Melissa Miranda! What an exciting day! I am thrilled and absolutely honored to be hanging out with all of you today as a guest designer at My Craft Spot. My name is Melissa and my little craft corner is called M. Miranda Creations. I don't know about all of you, but I am ready for spring and for Easter. And what a special holiday Easter is! Easter means life after death and all that has laid dormant through the winter months cry out the truth of it. Flowers bloom, babies are born, and the vibrant colors of spring decorate the landscape. So in honor of all the joy that Spring and Easter bring, I have made a set of colorful 3.5" square mini cards that my kids will give to their teachers. The little chick is attached to an Action Wobble so every time you make the chick wobble, its little eyes roll around. So fun! I took the Happy Easter sentiment from the set and snipped it in half. Oh no, do not gasp with shock. It is ok to take the sentiment apart and experiment with the layout of the stamp. By snipping the sentiment in half, I was able to get it to stamp on my banner the way I wanted it to. 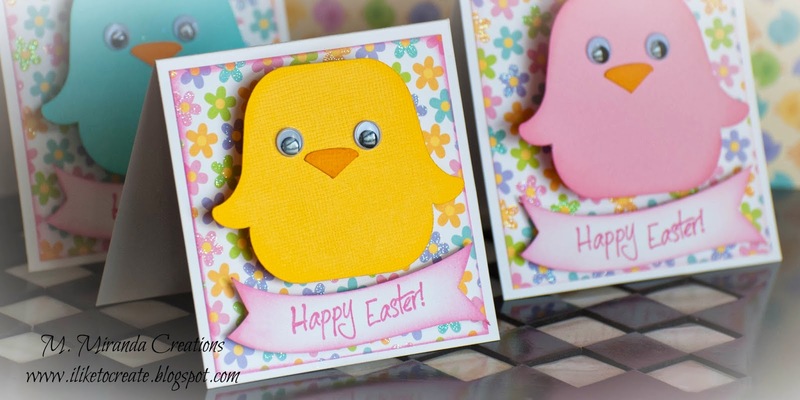 So to make your cute Easter Chick card start by cutting a piece of white cardstock 3.5" x 7". Score the cardstock in half to make a 3.5" square card. Next pick a piece of designer paper of your choice (I am using Doodlebug Design's Hello Spring collection), and cut a square at 3.25"x 3.25". Ink the edges. I found this cute chick on SVG Cuts. It comes from the Bunny Hop SVG kit and is located in the extras folder. Cut the chick out with its beak, ink the edges of both pieces, and glue the beak on. Then take googly eyes (is that what they are called? Well that is what I call them!) and attach them with glue. I then cut an svg banner from Miss Kate Cuttables and stamped my sentiment on it. I started assembling by attaching the square dp to the card base using my tape runner. I then placed my chick on an Action Wobble and attached it toward the top of the card leaving enough room for my banner. If you do not have Action Wobbles, just pop dot it instead so that you still have some dimension on your card. Next I centered my banner and attached it with pop dots. Easy peasy and so adorable!!! This set has so many awesome sayings for a multitude of occasions! Spring is beautiful, but it also has its rain showers. I think the sentiment I am using here goes perfectly with the feel of this card. When it rains, put on your rain boots!!! When life gets difficult, it is faith that gives us protection. I did not take a picture of it; but on the inside, I stamped the sentiment "Praying for You" from the same set. This card is easy as well even though it looks involved. Well the outside is anyway. For the inside there is an option to make it a pop up but I'm not always good at lining up the center of those things and I like it better plain on the inside anyway. 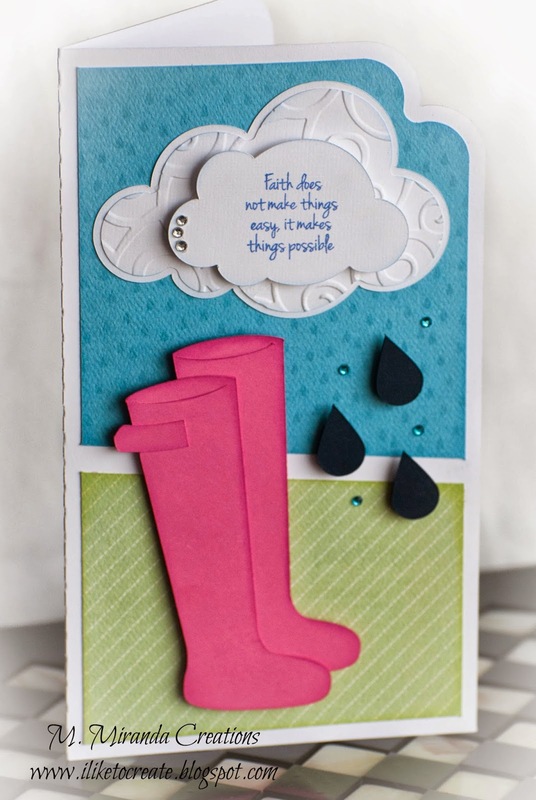 This card is also from SVG Cuts and comes from the same Bunny Hop kit. Just follow the assembly instructions found on the PDF or watch the assembly video that is listed with the kit. Once you have cut your pieces; ink the edges, emboss the middle layer of your cloud, and assemble. Then add a few embellishments to finish it off. I hope you have enjoyed my cards. I enjoyed making them and using these great stamps from My Craft Spot. 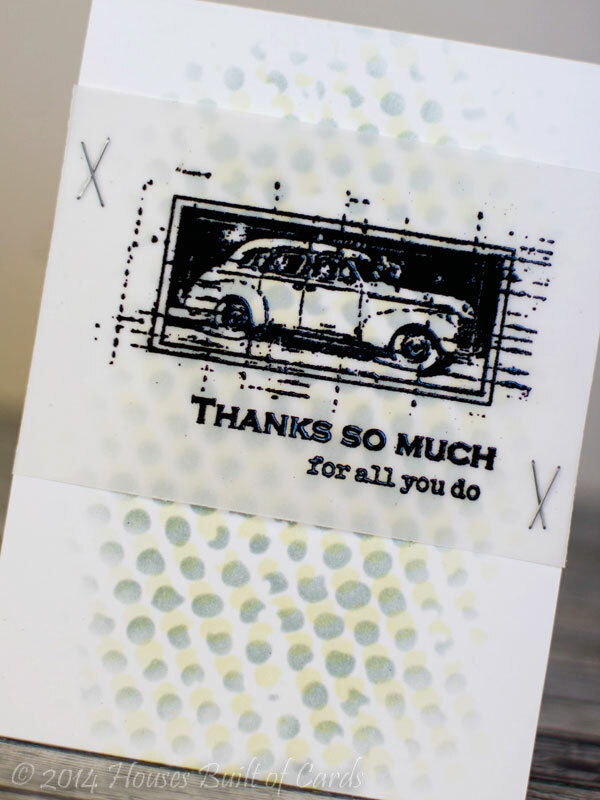 I hope you will stop by my blog as I will have all the links there for most of the products I used and I will have one more project to share with you using Kimberly's stamps. 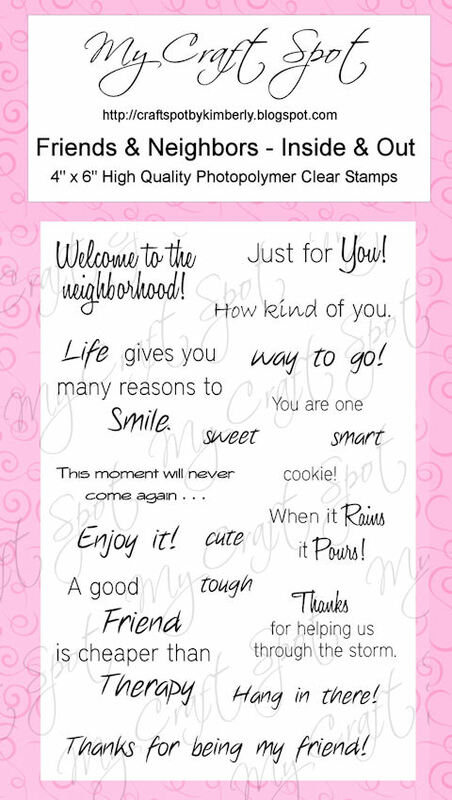 And of course, Kimberly is offering up a free set of stamps for one lucky commenter on my blog. You can find out all the details on how you can win there. 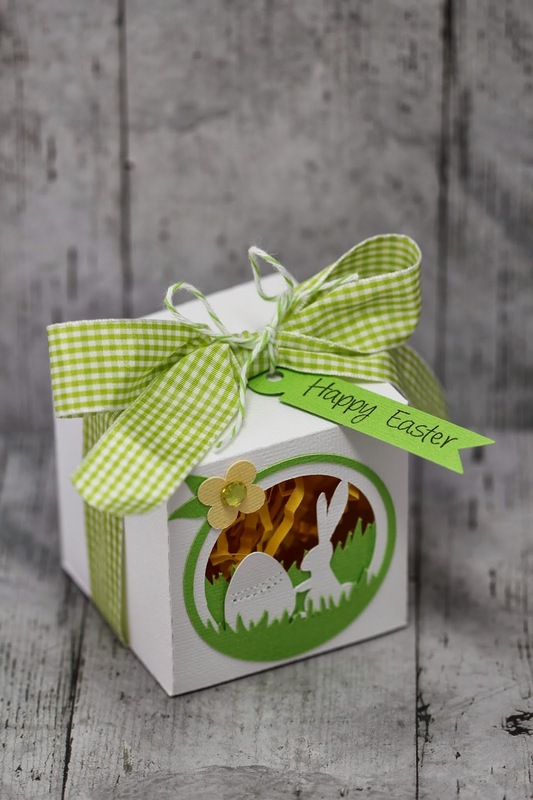 DT Post by Gwen - Gorgeous Easter Box! Hi everyone, this is Gwen from This and That by Gwen to share a super quick project with you today. 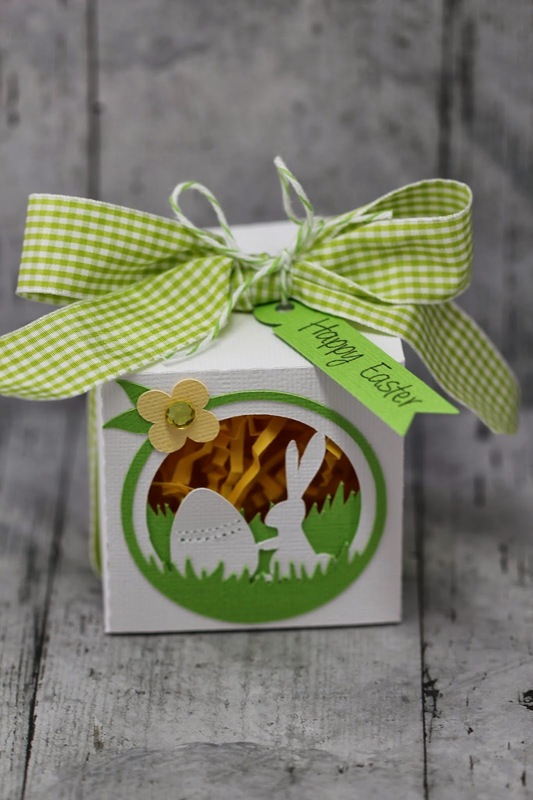 I love this little Easter Bunny box, I got it in the Silhouette Store # 57128. 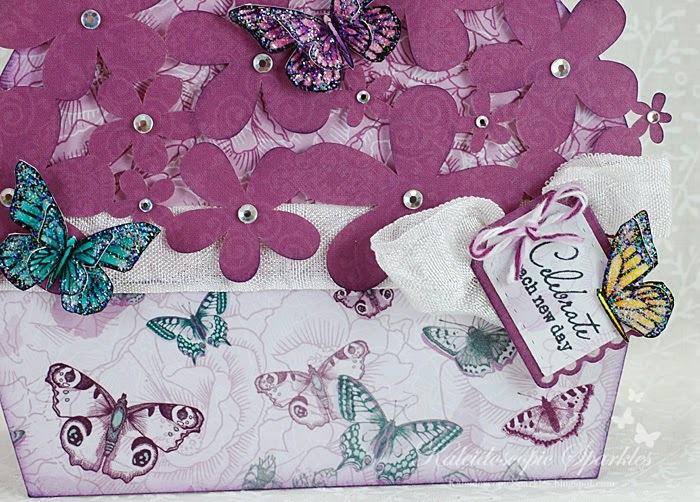 The tag was made using the Ribbon Banners - Straight Metal Dies and stamped with the Banner Sentiments stamp set. It was tied on with Pea Pod Twine. All of these products are from My Craft Spot. Winners from Challenge #129 - Pinterest Inspired! 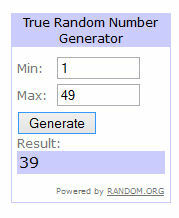 Congratulations #3 - Paula Bee! You won the Happy Easter stamp set! Hi Everyone and Happy Wednesday! 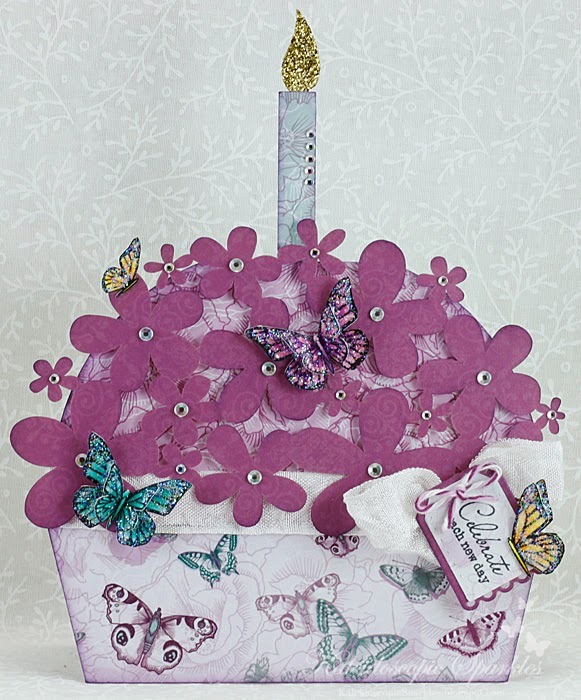 This is Sherrie from Sherrie Scraps with Passion to share a cute little birthday card using My Craft Spot's fun Birthday Wishes stamp set. The fun pattern paper is from The Paper Studio that I picked up at Hobby Lobby. I cut the zebra at 3 3/4 from the Create A Critter cartridge plus the layers. I cut a small panel for the center of the card and added a fun border using a MS punch. 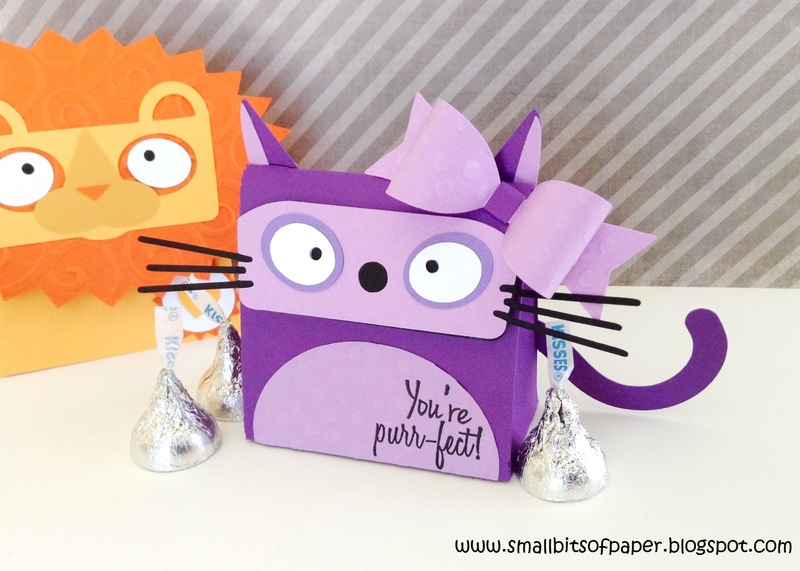 DT Post by Kate - 'Purr-fect' treat boxes! Hello crafters! This is Kate from Small Bits of Paper. 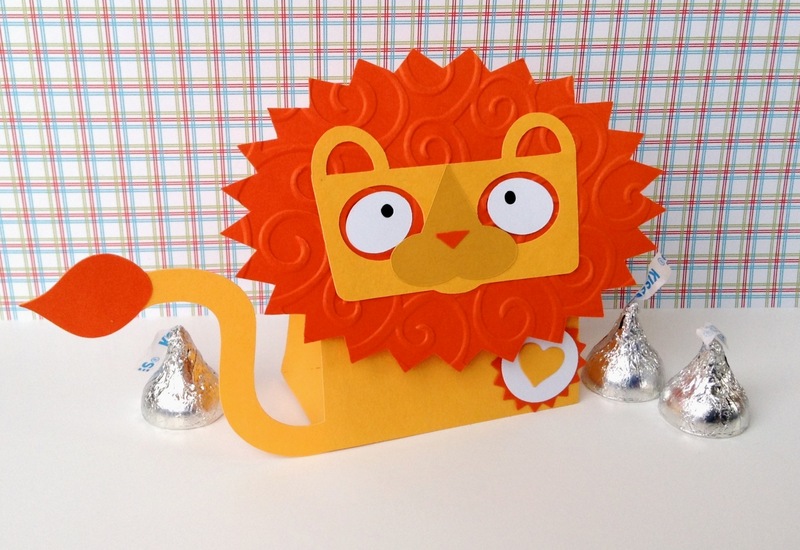 Yesterday, I shared a cute little lion box made for this week's design team challenge inspiration. I had so much fun putting the lion together, I decided to make a cat box too! The cat box was wonderfully simple to put together - but I felt that my cat needed a bit of dressing up. Here's where some wonderful My Craft Spot products came in handy! I used two stamps from Build a Valentine to create my own sentiment. Build a Valentine has a lovely mix of words and phrases that can be combined - and not just for Valentine's Day either! 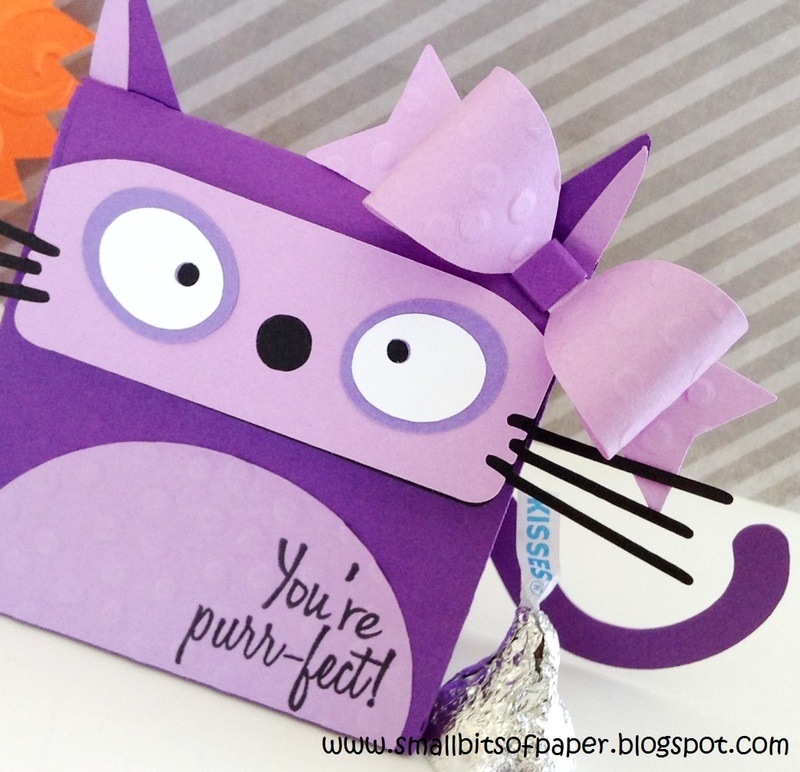 I used the Bow - Small metal die set to create the bow tucked by my cat's ear. After cutting the cardstock, I ran the paper through my Cuttlebug for a bit of extra texture. NOW my cat box looks complete! If you would like more details on how I created my cat box, please head over to Small Bits of Paper. Monday Challenge #130 - Anything Goes! Gwen's cookie is super cute! I love the fun glasses - perfect with this sentiment! Karen's card is absolutely beautiful! I love her flower 'frosting' and her gorgeous butterflies! So pretty! Sherrie's purse is sooo cute! What a fun cut file! I love the fun pattern and colors she chose! 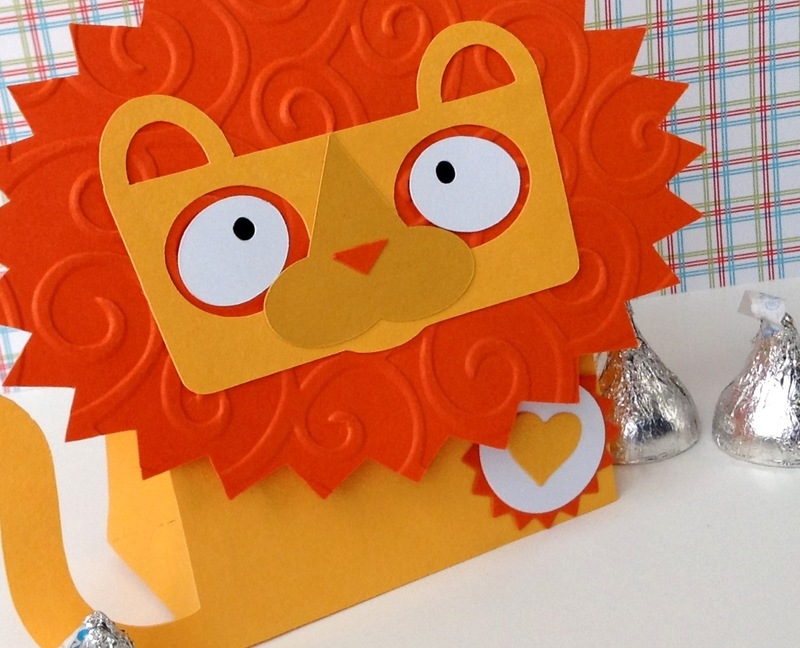 Kate's lion box is adorable!! What a fun idea! I love the embossed mane! Just for fun: Here are some projects made with the Friends & Neighbors stamp set. In need of inspiration?! Click HERE to visit our Gallery with over 1000 projects arranged by stamp and metal die set! You can even search by Holiday, project type, or products used. So much inspiration all in one place!! Hot Dog! You Did It! DT Post by Karen - Gorgeous Flower Vase! Winners From Challenge #128 - Cute Critters!! DT Post by Heather - Welcome Little One! DT Post by Sherie - Beautiful flowers! DT Post by Sherrie - St. Patrick's Day Treats! 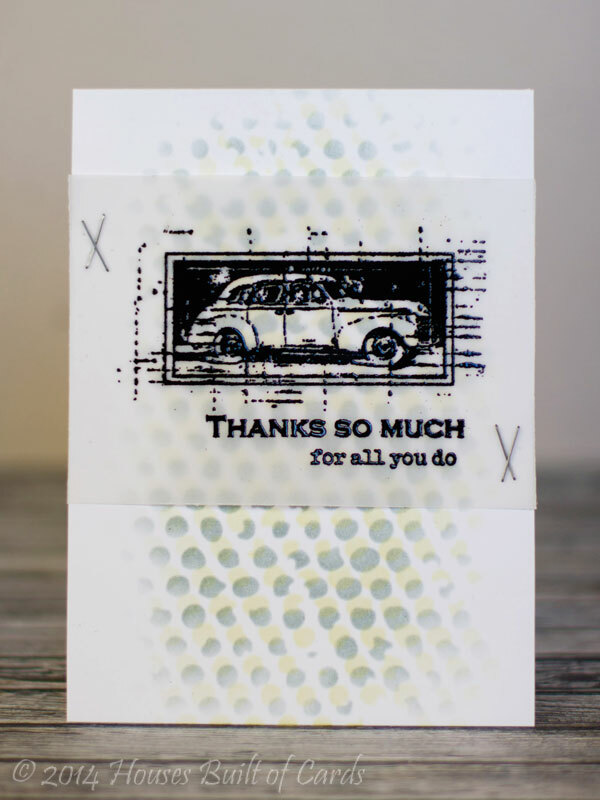 DT Post by Tanya - Awesome shaker card! DT Post by Karen - Nuts about you! DT Post by Gwen - Say Cheese! Monday Challenge #128 - Cute Critters! DT Post by Tanya - Make Today . . . Amazing! Winners from Challenge #127 - Fun With Puns! DT Post by Kate - Adorable Tissue Box! DT Post by Sherrie - Adorable Elephant!